As the weeks and months go by, I find myself with an increasingly overflowing box in my bedroom which contains numerous empty products ready to be photographed for the very last time. There was a time when I considered putting a stop to these posts, mostly because I felt like they were outdated and that nobody wanted to really read them, however upon reflection they do appear to be some of my more popular beauty posts, therefore, for the time being I will continue. I first heard of OGX through Caroline Hirons where she raved about the OGX Kukui Oil Shampoo. I personally, having now tried and used that also loved it, therefore I thought I would try something else from the range. The OGX Awapuhi Ginger Shampoo unfortunately didn’t impress me as much as the Kukui Oil version as I felt as though my hair wasn’t as silky soft as I had expected it to be when I had used this. I also noticed that it was hard to brush through, as though it was more knotted up which was an odd experience. Whilst I would most certainly recommend the Kukui Oil version to anybody, I sadly will not be repurchasing the Awapuhi range again. Having used No7 skincare in the past and really liked it I was very keen to try one of their latest releases. The Early Defence range has been designed for younger skin which isn’t quite at the stage where anti-aging products are needed. Instead this has been formulated to help protect the skin by boosting the skin’s own defences, helping skin to look younger for longer. I really liked the fact that this has SPF15 and 5* UVA protection within it. Sometimes I can forget to use SPF therefore this was a factor I really appreciated. It was a light weight cream that didn’t feel greasy and left my skin hydrated and brighter. To be honest I have no negatives to this moisturiser at all barring the fact that it is almost £20. For me this seems a little expensive for a Boots own brand, that being said, I cannot fault the product itself. Over recent years I have tried a variety of different purple shampoos in order to tackle any unwanted brassy tones in my hair. Without a doubt one of the best ones I have found comes in the form of Bleach London’s Silver Shampoo. I use this on both dry and wet hair depending on how long I have left it since I last used it as I find that using it on dry hair makes the effect of the toning more apparent. In doing this I do have to be careful not to leave it on too long or I will definitely come out of the shower with a blue tinge to my hair. That being said, I highly recommend this to anybody with blonde hair as part of their hair care maintenance, it’s pretty darn good if I do say so myself. Generally speaking, my scalp is very good, I rarely suffer with any form of dandruff unless I have used something which has not agreed with me. Therefore, unfortunately I cannot really comment on this product in terms of helping with that condition as I haven’t had to deal with it whilst using this product. I can therefore only really comment on the qualities of how it worked for me in terms of it just being a shampoo, in which I can say that it performed really well and really was very cooling on application, in fact remarkably so. This would make a great summer shampoo that’s for sure! This for me is a very luxurious product as I rarely spend more than £2 on shower gel as I find it very hard to justify. That being said, I cannot deny that I truly loved this product; if money were no object then I would happily purchase this for myself regularly. As a beauty blogger I absolutely love trying new brands, no matter if they are low, mid or high end as you just never know what you will discover. That being said, when it comes to mascara I rarely leave the aisles of the high street as I firmly believe that the high street performs fantastically well in this area; particularly MaxFactor. Personally I must have now been through about four of the MaxFactor False Lash Effect Mascara as it works so well for me. I have quite long lashes so rarely look for anything which claims to add length, particularly because I also wear glasses 90% of the time. This adds a perfect curl and volume which is all I am really looking for. If you’re looking for a liner with super pigmentation and an extra fine nib, then Pixi has the perfect one for you. Being one who is quite partial to liner I was really impressed with this offering from Pixi. It is easy to use, light weight and stands up well throughout the day, plus it is easy to remove of an evening which ticks all the boxes as far as I am concerned. The only downside is that it always appears to be out of stock every time I look for it. This is a really nice light weight eye cream if you do not suffer from dehydration around the eyes. I first started using this during summer time which I felt was the ideal time for it. I wasn’t really suffering from dehydration as this tends to happen for me as we hit the autumn and winter. During those months I like to opt for something with more of a kick, however this is a nice option for those who don’t need something quite as heavy. At first I wasn’t sure whether to include this or not as it is a tiny little sample which really does limit the experience of a product, that being said, I still was able to get a feeling for this. In a nut shell I liked this mascara quite a lot, mainly because it has a natural bristle brush which is what I tend to prefer. I found it to create a slightly more ‘clumpy’ look in comparison to the MaxFactor mascara above, although it wasn’t anything over the top in the slightest. For me this is more of an evening mascara as opposed to every day and it is one that I would look towards purchasing for that reason alone. In truth I loved this little mask, it is so affordable and widely available across the country. It is soothing on the skin and relatively easy to remove, although I would recommend using a flannel in order to get every single bit off quicker. For £1.50 you really can’t go wrong if you’re on a budget, whilst it won’t completely detox your skin I do think that for the price it really is very good indeed. Unlike the sample of the Clinique Mascara above I find it very hard to gauge an idea on skincare when the samples are so tiny. This little sample of the Origins GinZing Eye Cream really is on the small side, it didn’t really give me much in terms of the product in order to try it over a few days, let alone a few weeks. Whilst I truly loved the scent of this, I am not too sure of its capabilities in terms of hydrating the eye area or masking dark circles; the latter of which I think it has in my case failed to do. That however could be because I was frugal and had a limited amount of product to work with. In all honesty I am on the fence about this, I want to love it because on a whole I adore Origins, however I think I will have to purchase the full size in order to try it over a longer period of time. 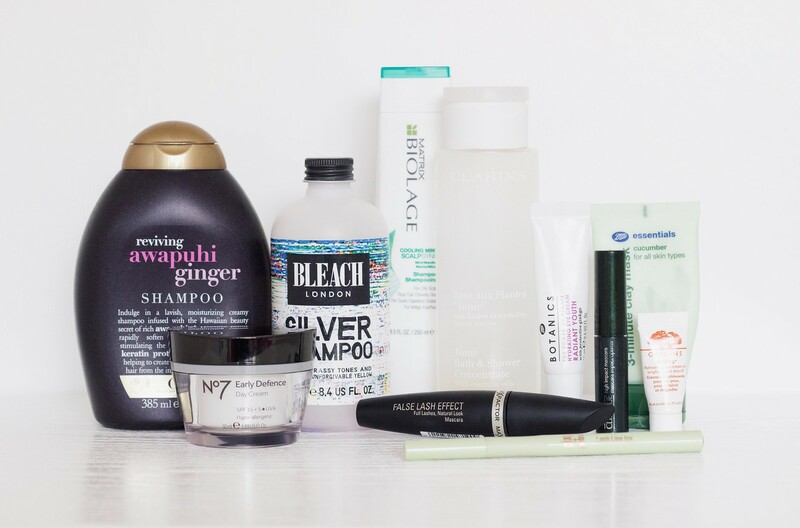 This was an incredibly long empties post to write, next time I won’t leave it so long!